Nothing melts my heart like a man's emotionally driven works of art. Something that those big, bear paw hands have taken the time to create a gift so intricate and delicate while utilizing the beauty that nature has provided them. Sailors valentines are such pieces that when I look at the detail of work I cannot help but swoon. Such love and adoration these men had for their loved ones while at sea that was often many months away from families, friends and lovers. See, already I romance this. 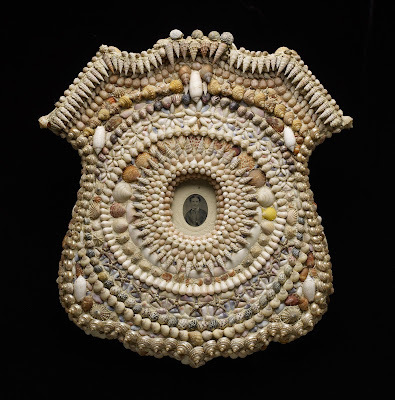 Sailor's valentines were created with colorful seashells found along the beaches of the exotic islands and ports they anchored at. 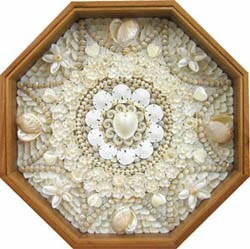 White shell sailor's valentines are rare and I love the pristine look of them. This valentine measures almost 24 inches across. 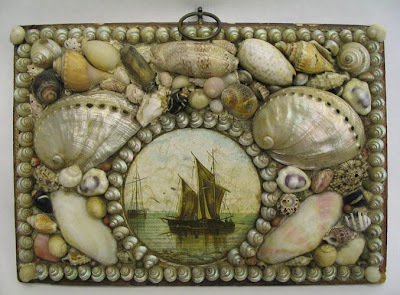 A smaller, later piece (late 19th century) using mostly pearliscent shells. 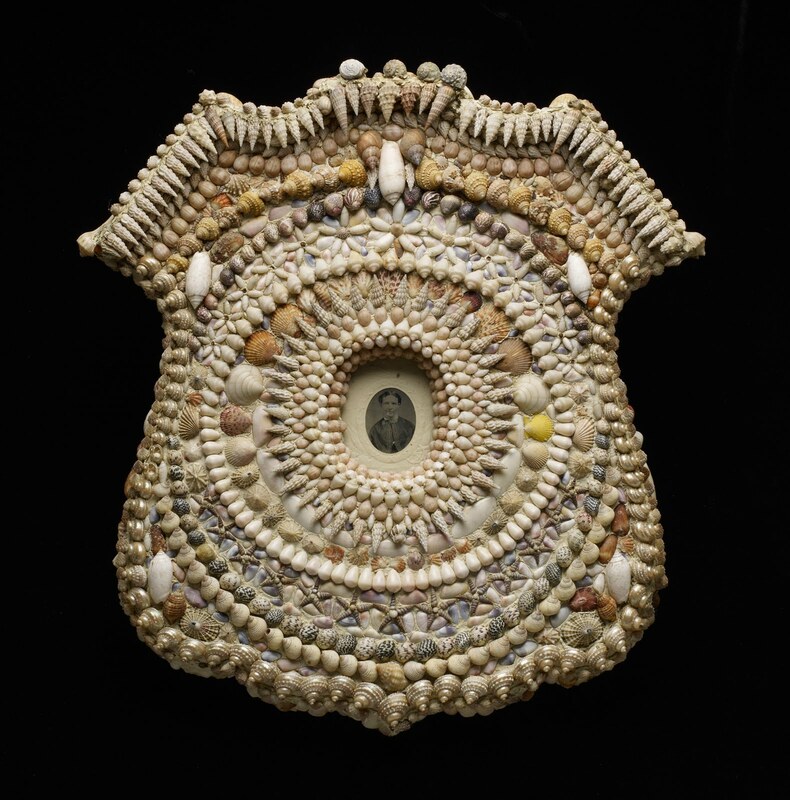 Pretty handpainted shell in the middle. 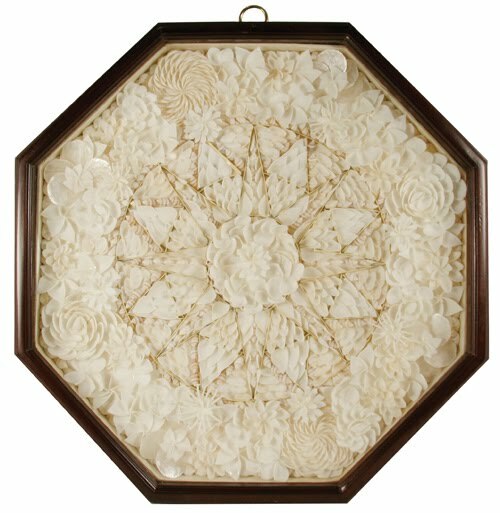 A contemporary piece using a vintage handmirror base created by Peggy Green. Miss Green does lovely work and you can access her website by clicking on her name above. 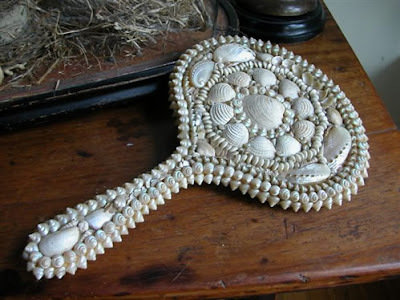 Such a neat handmirror, perfect for a sea witch. Of course, this is just silly, but I couldn't resist the photo when I saw it. But it did get me thinking of taking an old pair of platform shoes from the 80s sitting in my closet and converting it over with shells. I may have to do that one day. Italy was wonderful as always, but the real joy was visiting my Italian raviolis. They are all doing well and will be moving back to the states in about 6 weeks. Daddy will also be back from downrange and the family will be complete again. Can't wait to visit them in New York after they have settled into new digs. Got caught up on a lot of chores and tasks this weekend and one of my top things to do was swing by Vintage Village to do a little shopping and indulge in some shameless gossip (the good kind) with dealer friends. As many of you know, Vintage Village is one of my favorite shops for buying and now, "one vintage hag" has also launched a Vintage Village blog. What a marvelous way to network, those hags are so clever. Of course, I found some wonderful things for myself such as a fabulous antique, black prairie bonnet from the 1880s. Wonderful condition and very wearable...this is going in my personal collection. A terrific Edwardian wall hat rack and coat rack with tiny mirror in the center and a lovely, little silver plate footed candy dish that I will use to display vintage mercury ornaments. Vintage Village is known for its seasonal decorating and delightful items and spring is one of their favorite seasons. 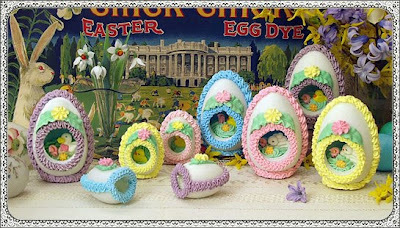 Lots of sweet Easter pieces, pretty shabby cottage items and of course, some of the best gardening decor you could want. I snapped a few pics to share. I am crazy about this wonderful Victorian lamp. How delightful is this huge, foiled vintage egg? Love the cabbage roses and the pretty pair of boudoir lamps. How much fun would it be to set them all ten minutes apart from the time you need to get up? These alarm clocks are terrific. Sweet traveling tea set...perfect for an Alice In Wonderland tailgate tea party. I'm trying to talk myself into why I "need this" Victorian quad plate chocolate pot. Sweet little peeps and glitter spring eggs. So many pretty things, it is hard to choose just one item. I adore vintage birdcages as decorative lighting. I will fill them with tiny, white lights and fresh cut flowers and hang them around my patio or deck. Wonderful selection of antique yellow ware and a pretty transfer lidded container. There is nothing like waking up in a garden of roses and these vintage sheets and pillow shams make a lovely bedroom garden. So many pretty spring things, so little space. 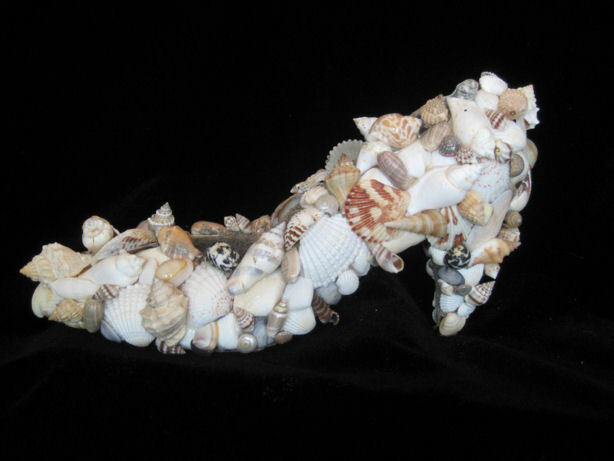 How fantastic is this 48 inch in length "at the beach" painting? Makes me want to run away to the sea right now. She has a give away price on it too. Now, I wanted to share one of the items I found at another stop...this delightful vintage "Little Cutie Pie" cookie jar. She was filthy and has two small chips along the lid from too many hands lifting it open to access home made cookies. I paid $13.00 for her and figured after cleaning her up I could list her at about $40.00 as vintage cookie jars are always good sellers for me. Imagine my surprise when I found her book value to be at $455.00 in pristine condition. A little more research and she is one of the most sought after next to Little Red Riding Hood. Other then those two small flakes, she is in lovely condition and the freckles across her nose are so cute. I have her listed in my booth for $300.00 as these seem to sell well and close to book value even with minor damage. Yes, I have been missing for few days as I am in Vicenza, Italy visiting my precious raviolis better known as my grandchildren. I left on Sunday afternoon and have been having a ball with them ever since I arrived on monday afternoon. The twins, Kelsey and Connor! Be still my heart. Big sister, Kaitlyn. Too adorable for mortal words and she makes me laugh. Yesterday, while Kaitlyn took a gymnastic class, her mom and her two Italian girlfriends and I took a walk around the block where her gymnastic class was held and came across this magnificent, old residence. The two Italian women explained that this was built during the 18th Century and that Napoleon had crossed the nearby bridge and camped on the residence. Original main building, original windows and doors. Windows are deep set into the stone and are huge. Original shutters still remain. It is spring in Italy and many of the homes fill these window sills with lovely flowers. Closeup of the gate at the front entrance. Hello Everyone. Today I have been bestowed with the Beautiful Blogger award. (you can't see but I'm blushing a bit as I'm not the kind that is comfortable with receiving awards) So thank you, Ramblings of a Newbie Pagan who has so graciously given me this beautiful blog award! I am often amused that anyone would find what I had to say worth reading or want to view my photos and even go so far as to leave a comment or two. 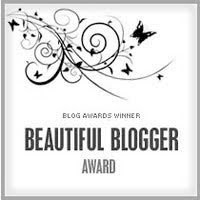 What I am is grateful for are all of your friendships and delightful words and that, to me, is worthy of you all receiving a Beautiful Blogger award. What I like about this award is that you have the opportunity to share blogs that you have newly discovered. Something that I have a recently had a treasure trove of. Please be warned that my taste is highly eclectic but then that is the fun of this award. You get to share what you find interesting blogs with others. So here goes. 1. I won the UN Poster contest three years in a row as a child in Catholic School. 2. I wear vintage clothing whenever I can and at one time I had over 250 hats in my personal collection. 3. My top five books are "To Kill A Mockingbird", "A Prayer for Owen Meany", "The Lovely Bones", "The Stand" and "The Color Purple". 4. I must eat a piece of "good" chocolate every day. 5. When the world around me begins to shudder, I will often make soap or spin fiber. Both activities set the energy around me to a more gentle turn. 6. My baby sister and I can dissolve into a puddle of giggles over the stupidest things. 7. I still use a fountain pen to sign my name. 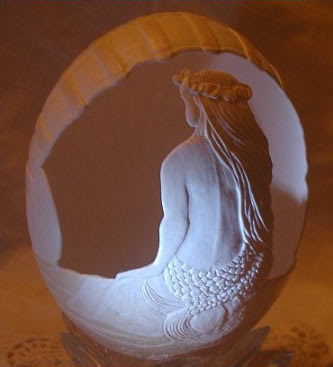 1. http://amanwhocrafts.blogspot.com/ Extraordinary work in paper. Love his "The traveling corpse project." 2. http://thewasherwoman.blogspot.com/. Delightful blog and just plain joyful. 3. http://wwwbobbypinsboardwalk.blogspot.com/. Step by step on repurposing furniture and other decorative elements. 4. http://thegypsyfish.blogspot.com/. Lovely digital art. 5. http://lemonadekitty.blogspot.com/. Fun little blog to visit...crazy about the name. 6. http://mind-wideopen.blogspot.com/. More terrific digital art. 7. http://www.nannygoatsinpanties.com/. The name of this blog alone announces that this will always be a fun blog to visit. 8. http://sandinmyyarn.blogspot.com/. Knitting, fiber, ravelry...what more could you ask for. 9. http://themermaidsmercantile.blogspot.com/. 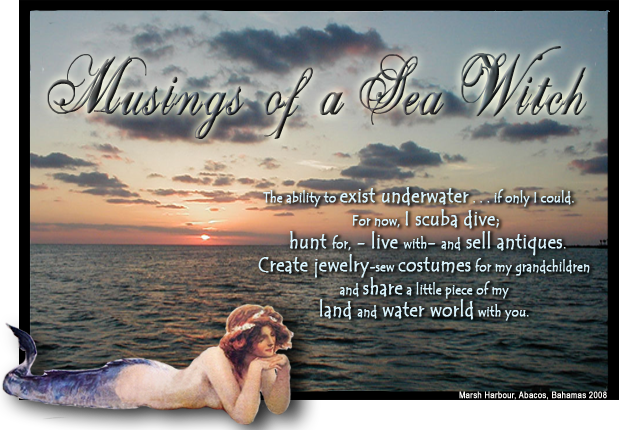 Fell in love with the name of this blog as I have a merchants soul, toss in a dash of mermaids and I'm all over it. 10. http://yellowbeachdog.blogspot.com/. Just a sweet, gentle blog full of snippets of everyday life. 11. http://adventuresofgingeyginge.blogspot.com/. Everything pinup. Always a fun blog to visit. 12. http://piggystales.blogspot.com/. Okay, this is a girlfriends blog who I am shamelessly promoting...but it does fit the category for this award as she is a new blogger, but boy is it a delightful one. 13. http://awhimsicalchick.blogspot.com/. Another girlfriends blog who I am also shamelessly promoting...but it also fits the category for this award as she began her blog the same time piggy tales did. She is a sweet soul and both are the ladies from my Sunday afternoon build a blog get together. 14. http://boneheadstudio.blogspot.com/. Inspiring and joyful work by this doll artist. 15. http://delightfulclutter.blogspot.com/. This is my kind of clutter and I know you will enjoy visiting this blog as often as I do. So there you have it, 15 new blogs to visit if you are not already aware of their existence. I hope you enjoy getting to know them and "newbie pagan" thanks for the Beautiful Blogger Award. "Lace" is one of the most evocative words in our language. It suggests an elegant sensibility, a delicacy offering a diverse variety of styles and patterns. 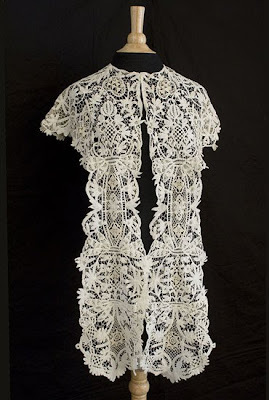 The word “lace” comes from the Latin meaning a noose or snare. Most likely its earliest origins from early fisherman who used the looping of threads into nets. As a needlewoman, it is no surprise that I am a collector of women’s textiles. Fiber into fabric and fabric fashioned into the everyday pieces that surround us from clothing to household goods to embellishment has always fascinated me. 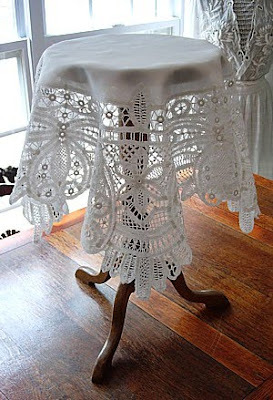 Although I adore lace in all of its forms, it is the Battenberg lace technique that has always called me. 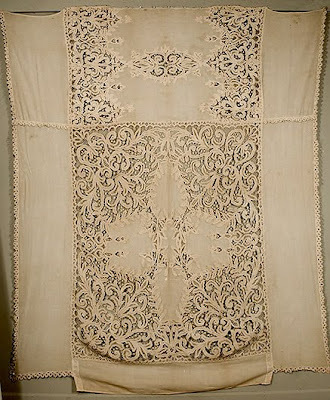 I have antique Battenberg lace pieces around my house and in my closet. Battenberg or “tape lace” can be traced to the 16th century, Battenberg lace was first created when Queen Victoria of England named her son-in-law as the first Duke of Battenberg in the late 1800s. 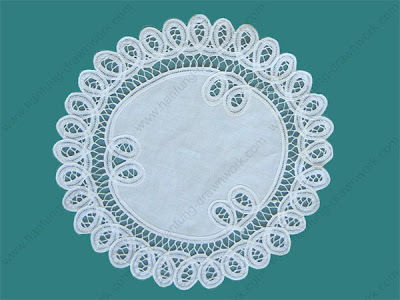 Every English Duke had his own lace pattern. Thus, a new style of tape lace called Battenberg was invented and became quite popular. During the 1930s and 1940s, making Battenberg lace was a fashionable American hobby made easier by readily available machine-woven tapes. The most readily available Battenberg lace items can be found at every department, fabric and craft store. Who among us has not seen the Made in China pieces that abound? I’m afraid I’m a bit of snob when it comes to Battenberg and do not own any of the modern pieces. If you have ever come across or are fortunate enough to own antique Battenberg lace you understand my snobbery. There is nothing quite like it. 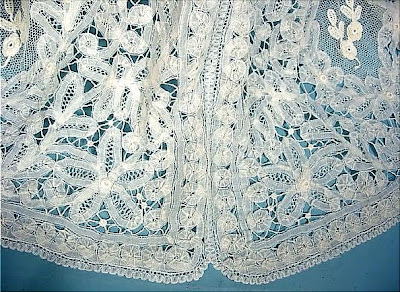 Detail of antique Battenberg lace. No comparison to today's modern pieces. Lovely antique Battenberg lace parlour tablecloth. Circa 1890s. Detail of gown train. The hours spent creating this masterpiece are mind boggeling. 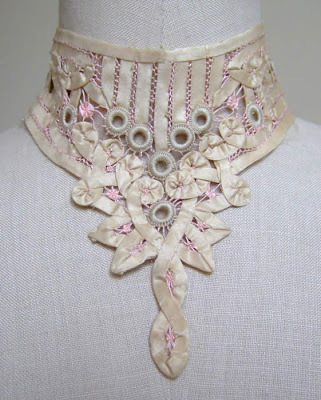 Lovely Edwardian color made from silk tape with pretty pink accents. Pretty overlay jacket. I have a similiar piece in black that I wear. Circa 1910. 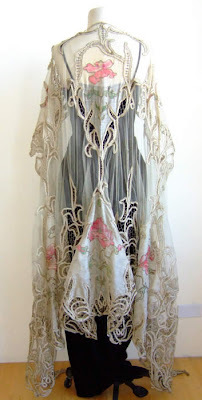 An exquisite floor length jacket from the 1910-20s era combining silk guaze, battenberg lace technqiues and silk embroidered flowers in the art nouveau fashion. I would love to own this lovely garment but it is too costly for my humble pocketbook. But how smashing would the wearer be in this? With Easter only a few weeks ago, I was thinking of the egg and how it is decorated. There is such a purity in the form. 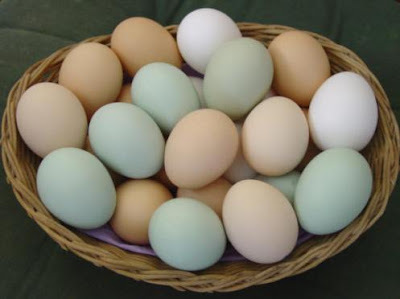 How pretty is this basket full of soft, pastel and natural color chicken eggs? My raviolis will be decorating Easter eggs soon. Brilliant, spring colors will abound and then they will hide them to find on Easter morning. The term "Fabergé egg" has become a synonym of luxury and the eggs are regarded as masterpieces of the jeweller's art. The eggs are made of precious metals or hard stones decorated with combinations of enamel and gem stones. Always exquisite and breathtaking. 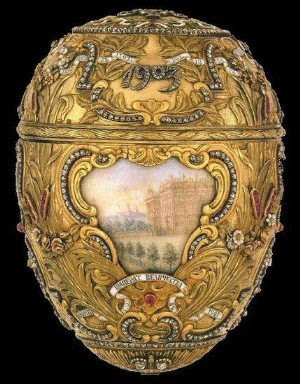 Another spectacular Faberge egg dated 1903. 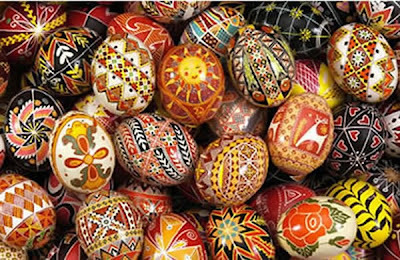 Lovely hand decorated Ukrainian eggs. All patiently hand wrought. 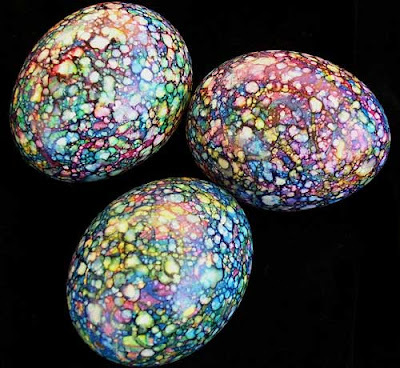 These are eggs decorated with a Victorian marbling technique. 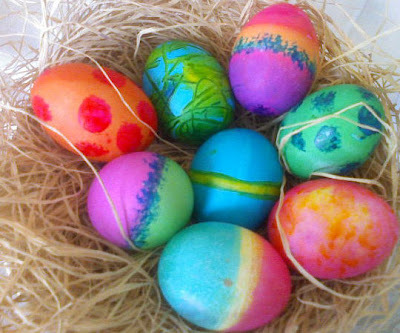 I adore these eggs for their detail and color. Brilliant. My sister's favorite eggs from our childhood. She loves these panoramic, sugar molded eggs. Time for another booth fill in...especially now that Easter is just around the corner, collectors are out on the prowl looking for something to add to their personal collections or even start a new one. I usually bring out my linens in the spring and I was busy starching and ironing over the weekend. As mentioned in a previous post, I like to iron linens. There is something wonderful about seeing wrinkled textiles and watching them become smooth and crisp with the passing of a hot iron and a little steam. So I brought in linens, bisque eggs and a pair of greenware infant heads. I know, I know their heads...but they are kinda cool too. Found more of my green depression glass so brought more in. Lots of deviled egg trays and pretty little pottery drawers for storing favorite recipes, found objects or treats. Sweet child's Edwardian slip. 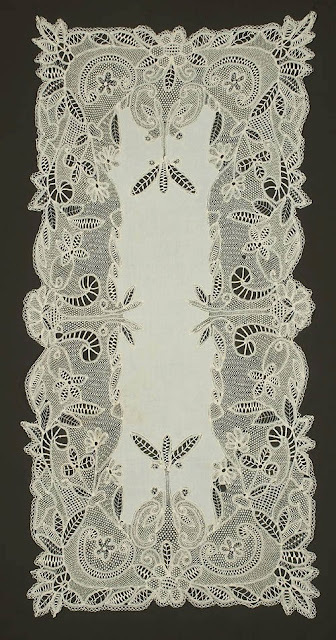 Soft, fine cotton batiste and pretty Irish filet crochet lace edging. Wonderful pairs of late Edwardian deadstock ladies shoes. Size 6 and 6.5, these have never been worn and are in wearable condition. Circa 1910. How about this smashing, soft rabbit fur ladies wrap or stole? Perfect condition, this is the wrap that every teen angel wanted to wear to that last dance of the school season. A selection of fantastic ladies envelope clutch bags in sequins and beads. All from the 1950s. Those fabulous Armetale mugs have already gotten lots of interest. Pretty doilies, crosses and painting.